Whenever I make these lemon squares, I think of my sister, who is quite a few years older than me. The day she got married and took off with her husband, leaving me as the last one behind at home, felt like the end of the world to me at 15 years old. Then I got to visit them and it all changed when she served up a plate filled with these delicacies. From then on, I couldn’t wait to go visit. She always had something new and interesting and exciting going on in her house and life and her tins were filled with lemon squares and cookies of all sorts and the most delicious dried peaches straight from the farm….sounds like perhaps the main attraction for visiting! 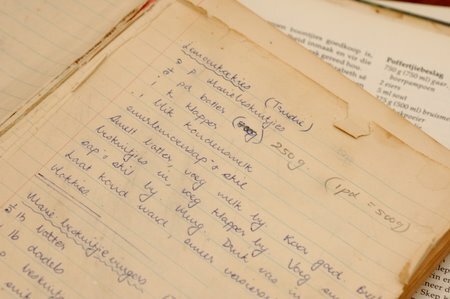 At some stage I inherited her recipe and it has become a favourite in our family too and of everybody else that “inherits ” it along the way. It is a non – baking cookie/biscuit and can be kept in the fridge for a long time, if you’re so lucky to have any left to last that long. Melt the butter over low heat and add the condensed milk. Stir in some lemon zest and juice to taste and mix well. Break in the biscuits and mix well until the biscuits are finely broken up en well coated. Press into a greased lamington tin, 24 x 34 x 2cm. Leave to cool down completely or place in fridge. Combine the ingredients for the lemon icing and mix to a smooth icing. 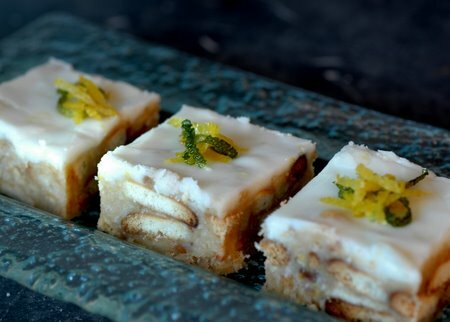 Cut in squares and decorate with some candied lemon and lime zest. This is an entry for Christmas cookies from around the world 2007, here at Susan from Foodblogga. These look fabulous! What else may be used for the butter biscuits? I love citrus flavors and these are so delicate! I was just thinking my oven needed a break! Thanks for sharing this great family recipe! What lovely cookies! Best of luck in the finals! Thank you for visitng and the kind comments! Canelaycomino: you can actually use any dry, or arrow root biscuit of your choice.